The paper builds on a previous paper by Hansen et al. (2016) which I summarized in Hansen 2016 got through peer-review — “Ice melt, sea level rise and superstorms”. Hansen 2016 ends with many questions which need to be addressed. 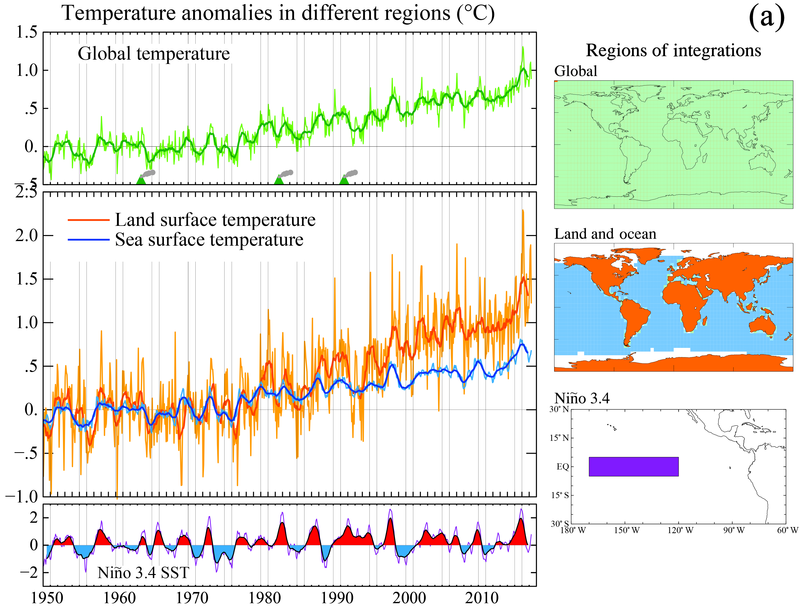 We show that global temperature has risen well out of the Holocene range and Earth is now as warm as it was during the prior (Eemian) interglacial period, when sea level reached 6–9 m higher than today. Further, Earth is out of energy balance with present atmospheric composition, implying that more warming is in the pipeline, and we show that the growth rate of greenhouse gas climate forcing has accelerated markedly in the past decade. In short: We knew for 35 years that this is coming,1 and we failed at stopping it. Now we have to fight hard to avoid the worst of the expected fallout. Keeping warming to less than 1.5 °C or CO₂ below 350 ppm now requires extraction of CO₂ from the air. If rapid phaseout of fossil fuel emissions begins soon, most extraction can be via improved agricultural and forestry practices.